It has been a while since I have posted for which I apologise. There have been a great many little and big bits and pieces that have needed doing and now we are finally settling down again. 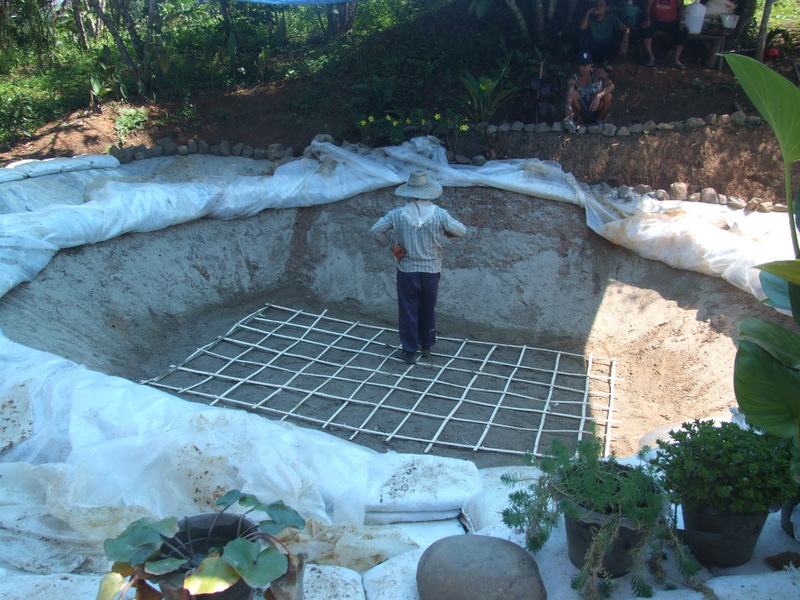 The first thing was the Swimming Pond. 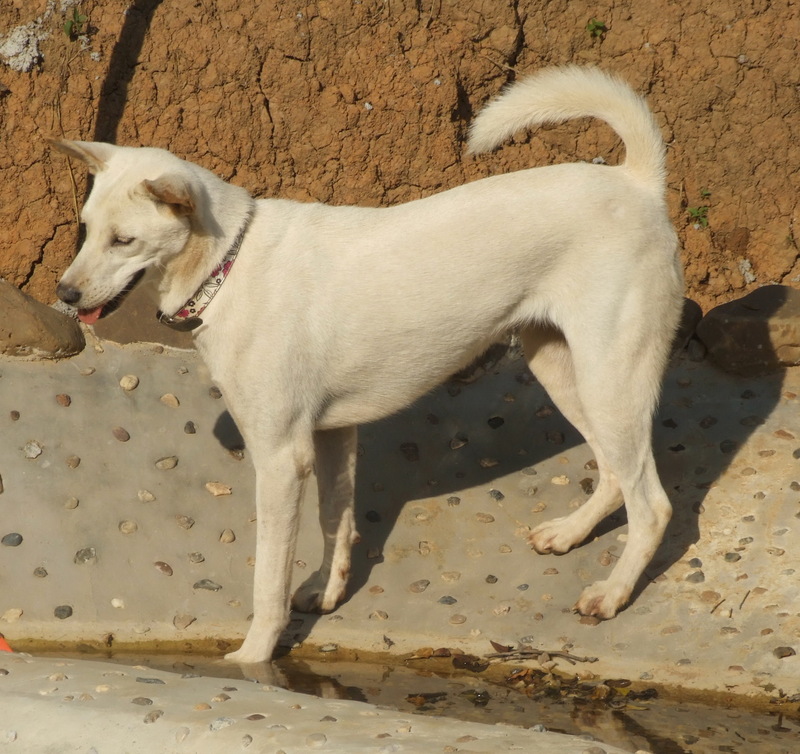 Well, I am sure all you out there that know about water and how CLEVER it is were falling about laughing when you read about how I was intending to keep the water in the pond. And you were right – it leaked like a sieve! So out with all those layers of plastic sheeting and down with concrete, for another try. 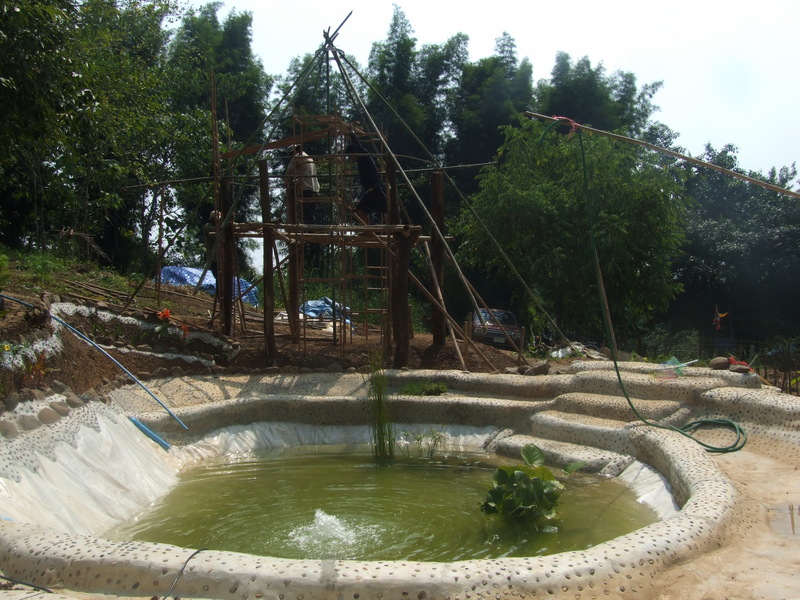 We lined the earth with a trellis of steel and bamboo and poured on a thick layer of concrete, than polished that and so far the bit that was polished is holding the rainwater well. Plastic folded back and trellis going in. Polishing the cement to give it a smooth waterproof finish. 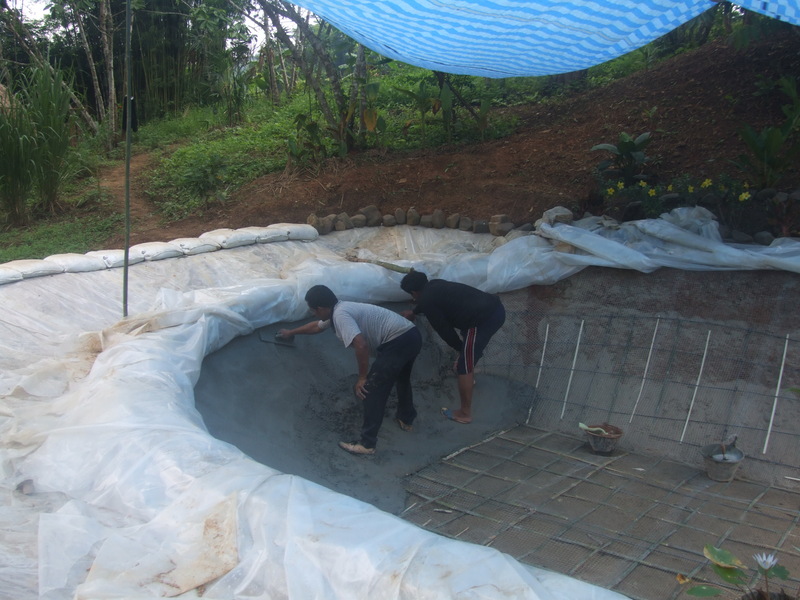 The next thing that needed to be tackled was the bags of dry cement, sand and stone mixed together that surround the pond. We have had very hot, then rainy days and the bags have disintegrated already – but the mix inside had not solidified into concrete and was just crumbling away. The workers suggested cement in this country is different so doesn’t work as recommended in other countries. Or could be that it wasn’t mixed well enough (mixed by hand). Doesn’t matter – except if someone is following my advice! (Don’t!) If I do this again I will mix with a bit of water then put in the bags. 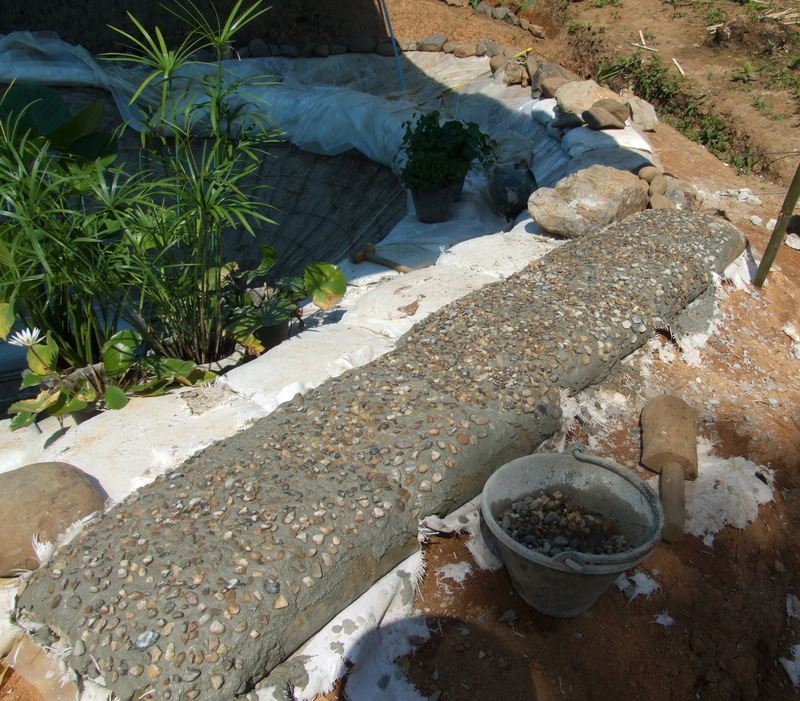 So we covered the disintegrating bags with concrete, with some pebbles to make it interesting. Concrete with pebbles – you can see the disintegration of the bags behind. 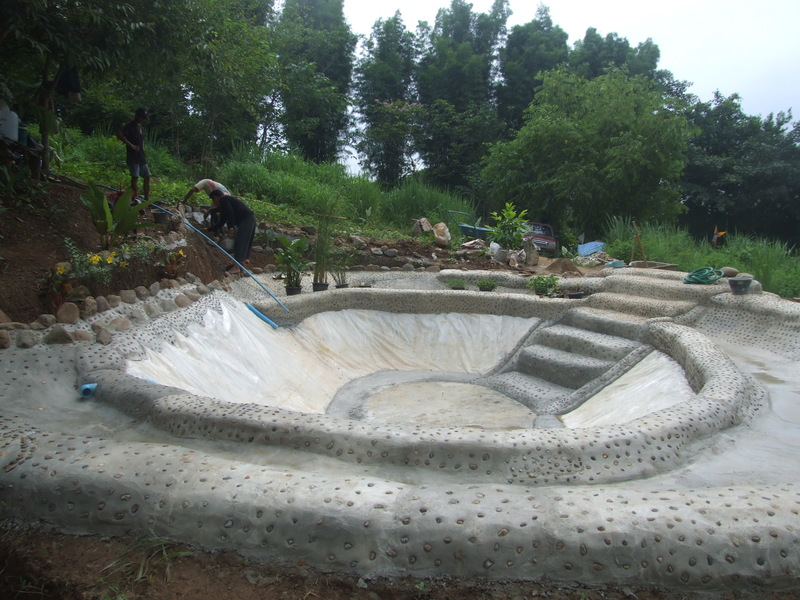 Finally we put the plastic back in the pond over the concrete, as I wanted to have pale walls to reflect the sky and sunlight. Still looks pretty good to me. Hope it works this time! 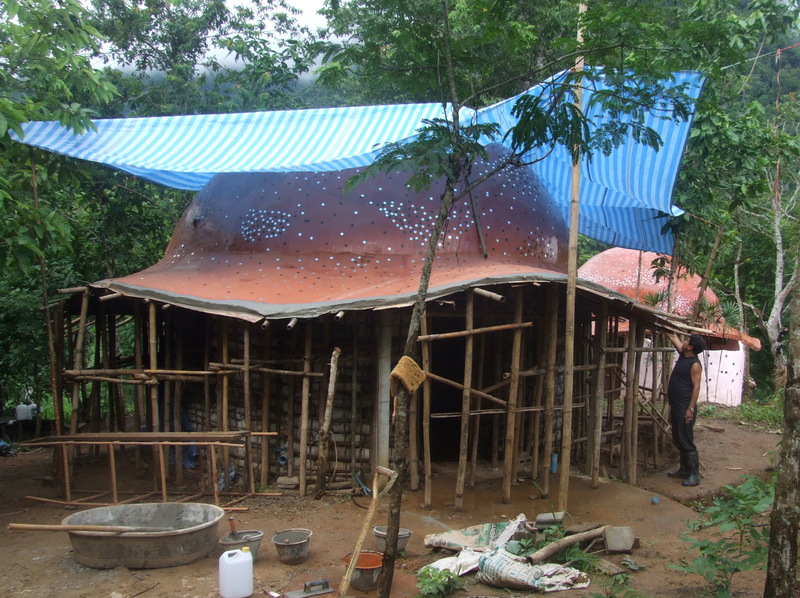 The second roof we made went so much quicker, as you can imagine, now we know what we are doing. Also the first roof has some leaks – but not the second. We keep on learning! Working on the lip around the eaves that captures the rain water and sends it where we want it to go. You can’t really tell from this photo but this roof is a slightly different colour to the other (not so much red in the mix) and we used little squares of green glass with the mirror squares for the mosaic, whereas the first dome had blue glass. 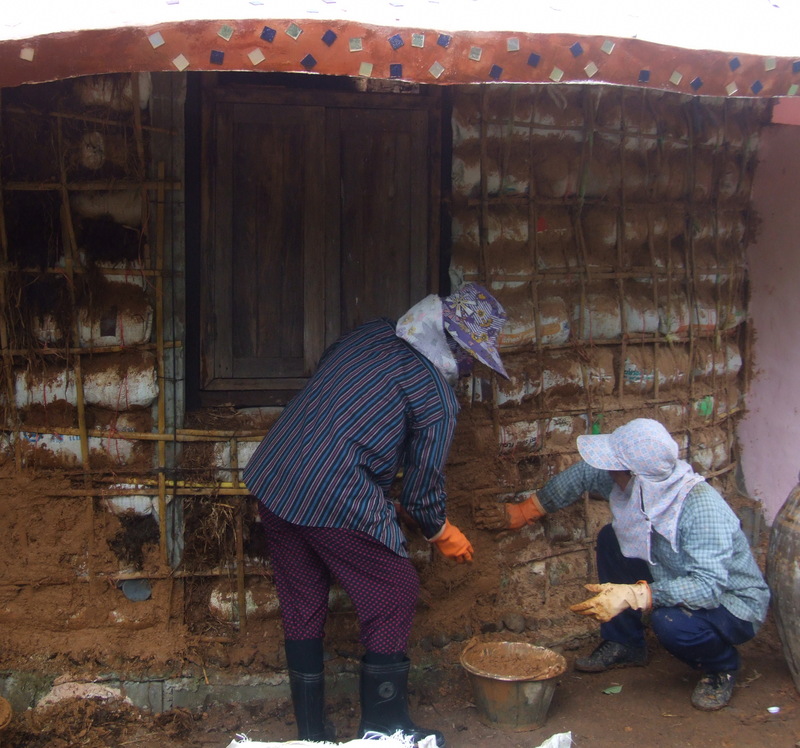 We begin to put cob and our own mixture of mud, sand and rice husks on the walls of bags filled with rice husks. Working under the eaves means we can carry on even when it pours with monsoon rain. The eaves work! We have some volunteers! It is wonderful that people are happy to come and help. 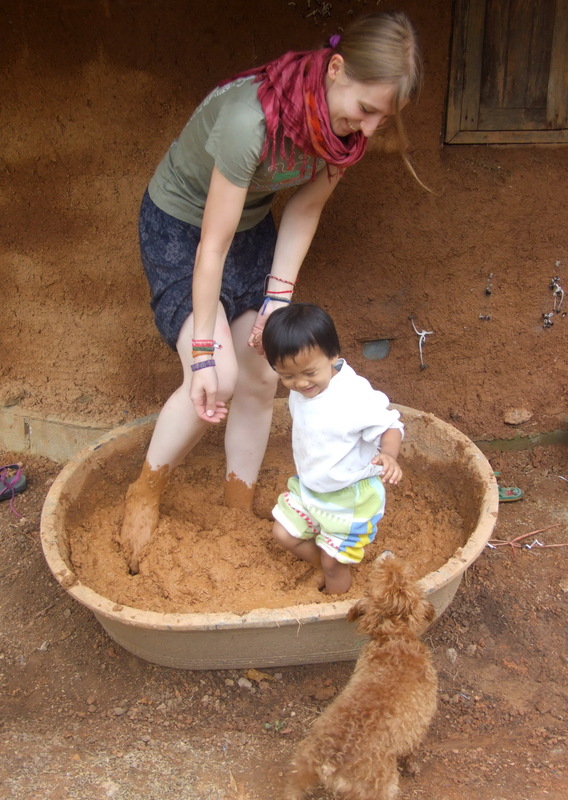 Here is Barbara being assisted by our littlest worker, and encouraged from the sidelines by Lucy the little red poodle. The best way to mix our cob. 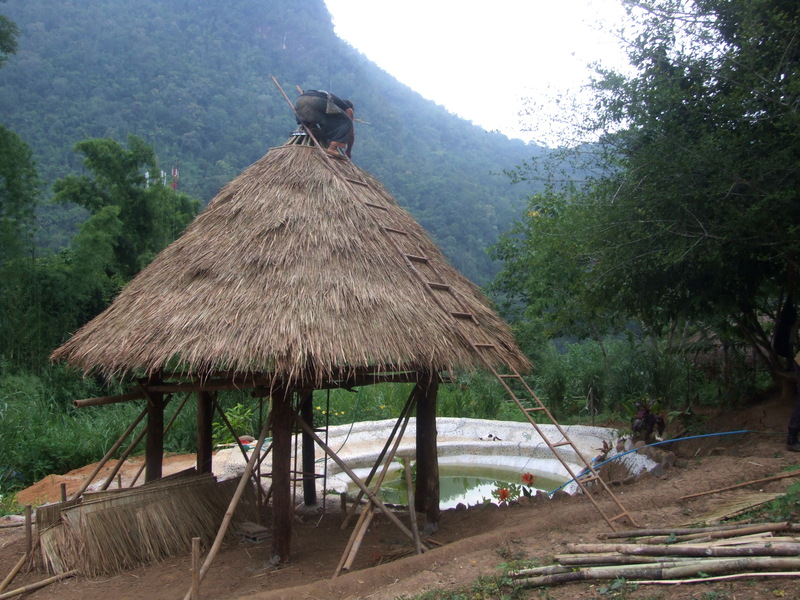 Next on my to-do list: a sala, A sala is a roofed structure without walls and very popular in Thailand. I would like one beside the swimming pond. I decided to get going on this so that we could use it for storing stuff while building three more roundhouses nearby. 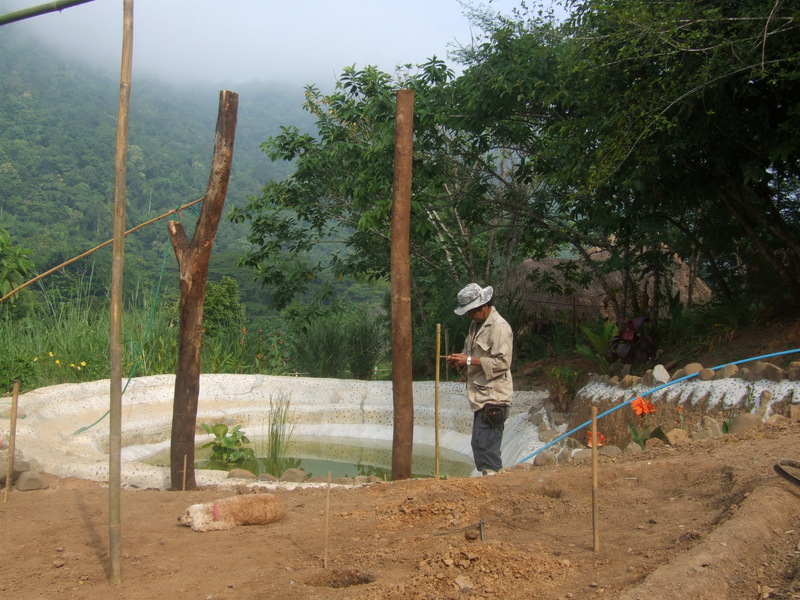 Planning where to put the old teak tree trunks that will support the roof. Next step the bamboo roof beams. Then on with the thatch. Once the thatch was on we worked on the floor of part concrete part wood. Below you can see us working on the wooden bit to stick out a bit over the pond. Working on the little wooden deck. It would have been great to have the whole floor of wood but the price was astonishingly expensive – for second hand wood! Note the top-knot on top of the roof. This was begun by Su Lupasco Washington several months ago as a sample of what to put on the top of the domes. But it did not look so good there. And here it is reinvented for the top of the sala, decorated by volunteer Benjamin. I think it looks great! 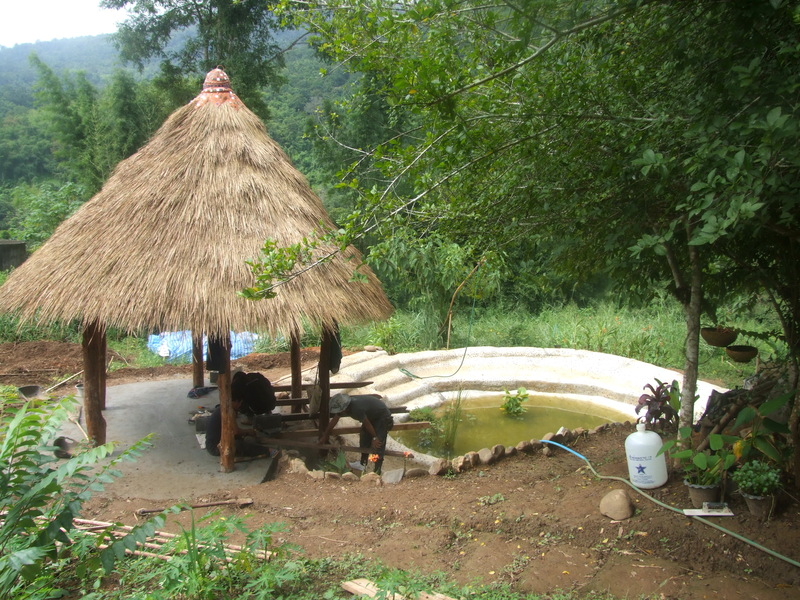 Finally, meet two new additions to Chiangdao Roundhouses: Muumuu and Chloe. 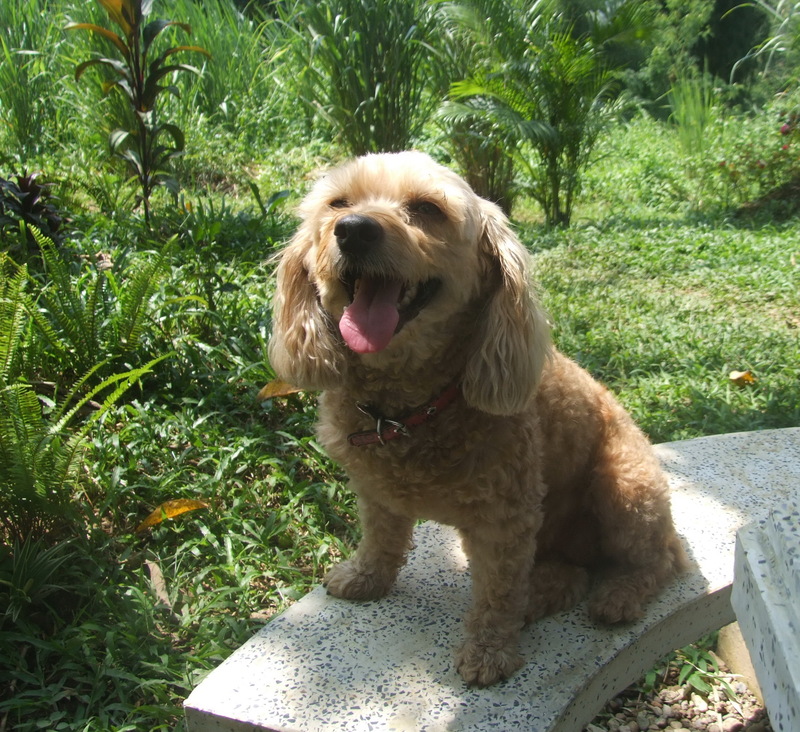 Both dogs were abandoned and rescued by Corinna Gogel http://www.helpfordogs.com. Muumuu belonged to a bar in Chiang Mai. The bar closed and the owners left, and left her behind. Their loss and our gain! Both dogs are really great and we are as happy to have them as they seem to be, living here. Thanks Dianne! I have heard there is a piece a bit further up my hill – I will investigate for you!